It’s that time of year again. Just when you’ve finally cleared your kitchen from Thanksgiving, it’s on to the next holiday feast. We know the feeling and thought we’d help by bringing back some good old farm-to-table inspiration. This fall, we teamed up with six of the chefs that participated in Taste of the Coast with POST to bring you the 2016 Edition of Grow, Harvest, Cook. 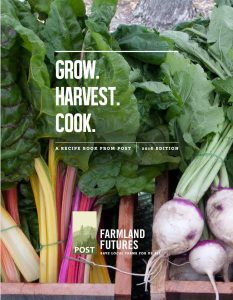 We hope that these recipes will help you and your loved ones savor the flavor of the many ingredients our local farmland provides. Download your copy and pack your holiday meals with a welcome burst of local flavor. Get cooking! A source of delicious local food is just one of the many benefits we reap from having farmland close to where we live. Protecting this land is now more important than ever. That’s why we launched our Farmland Futures Initiative to protect half the remaining farmland on the San Mateo County coast by 2026. Visit our website and learn about our success in protecting our region’s farmland. And, if you’re not quite ready to be thinking about cooking again, get out on POST lands and look for these seven animal tracks in the soft winter soil.